The Vera and District Lions Club were formed in 2011 and received our charter in November 2012. The above picture is from our yearly formal dinner dance evening, please do not think that is what we are all about. You will usually find us in tee shirts working and enjoying fundraising. The founder members of the Vera and District Club were in the main, experienced Lions members from the U.K who have made their homes in Spain. In recent years new members from British Expat community have joined our Club. 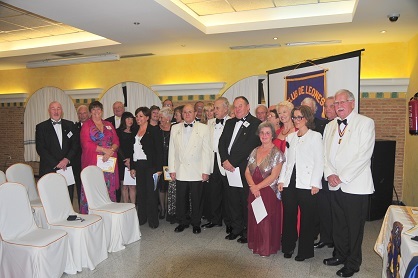 There are Lions clubs throughout Spain, some with a mixture of nationalities, some wholly British and some wholly Spanish all helping each other to serve the public. The nearest wholly Spanish Lions Club is located in Huercal Overa. There are Lions clubs in over 200 countries in the world with a membership of 1.35 million people. Whilst the Lions Clubs International can reach out across the globe with offers of help it is the role of the Vera and District lions Club to help local charities and other deserving causes. No member of the Vera and District Lions club receives payment in any form. Our work for the community is entirely voluntary. How do we help local charities and other deserving causes? We help the local community in various ways, see below. How- by fundraising. As a club we organise Fundraising events. This year 2019 will see our second big event, Party in the Park, an all-day music event held in Vera. We collect and resell second hand furniture donated by the community and are currently looking at opening our first charity shop near Los Gallardos. We have regular events such as quiz nights, and are looking to explore prize bingo, and fun race nights. Currently we work very closely with the local community. We support the local foodbanks, assist with equipment loan such as wheelchairs and walkers. Along with cot beds, this list goes on. We also help people in need and have a very good link with the local Nuns, and the Churches. Along with supporting Asprodalba, who help people with disabilities. Over our short existence we have helped many people in the community with specialised equipment for those in need. Various other means of support to people with serious illness, both Spanish and those who have moved into te area or have been passing through as visitors. If we are asked to help the answer is "How?" Our work is varied, and no-one is excluded from receiving our help.